There are already many ways that sustainable transport is already used by people in and around Hayfield, including walking and cycling to shops and school, car share schemes and commuting to work by bus and train. One of the Sustainable Hayfield objectives is to increase this use of sustainable transport and reduce our dependency on cars. 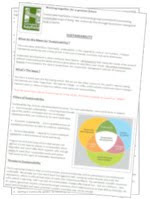 This web site will provide information on emissions from different types of transport, factors to consider when choosing a car and tips for reducing fuel consumption when driving. 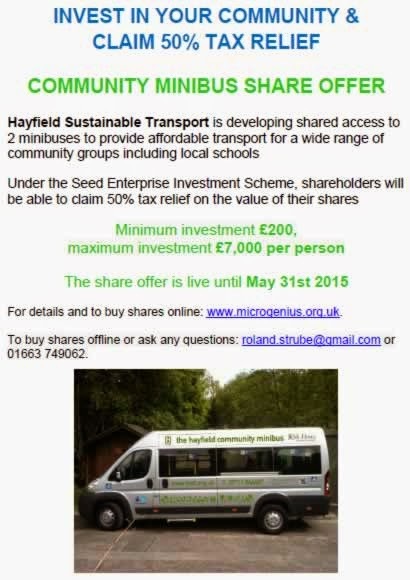 A community share offer that will raise the capital required to buy a second minibus, which will enable a cluster of local schools to transport a whole class of pupils at a time and replace costly coach transport. Sustainable Hayfield will be supporting local efforts to increase and improve the provision of footpaths and cycle paths in the Parish and to promote the training of cyclists.